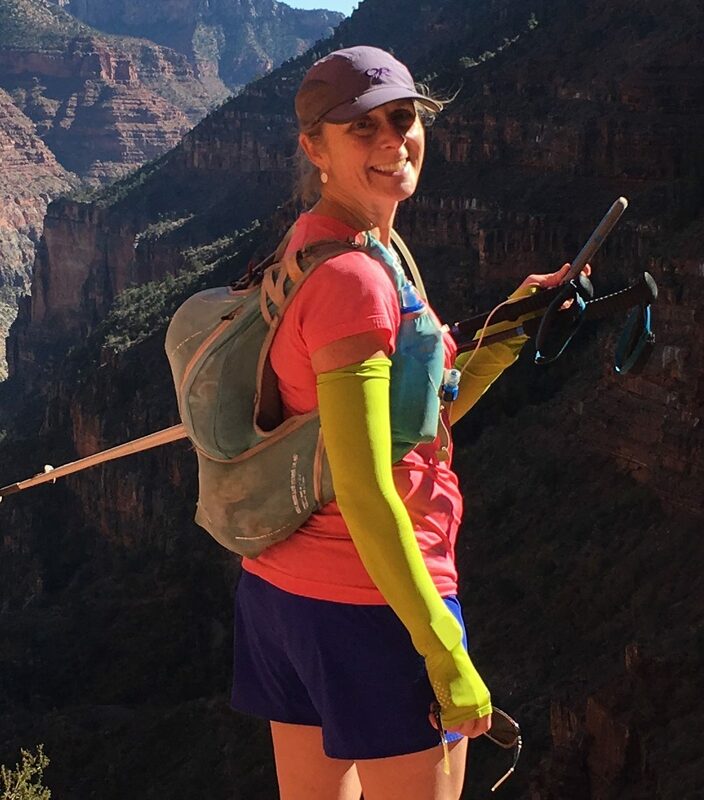 A few weeks ago, my friend, Ana, messaged a group of us looking for run buddies for several routes that she’d planned as part of her training for Mountain Lakes 100. When I saw the UPWC Owyhigh Loop on her list, I bit! I’ve been eyeing the UPWC routes and was eager for more exploration around Rainier—new trails, new views, new challenges! This route offered it all, and made for a wonderful long day on the trails. For those unfamiliar with the UltraPedestrian thing, you can check out their Facebook page and read about some of the amazing adventures people have been doing locally lately. The Owyhigh Loop is a new UPWC route this summer and is made up of several trails that encompass approximately 36–40 miles and 8,000-ish feet of elevation gain of the northeast side of Rainier: Fryingpan/Summerland, Wonderland, Cowlitz Divide, Eastside, and Owyhigh Lakes trails. We projected 12–14 hours for the route, and the forecast promised heat, sun, and smoke, so on Saturday I picked Ana up from her place in Seattle at 4:30 a.m. so we could get an early start. We were on the trail by 7, and started the 2,000-foot climb up to Summerland in relatively cool temperatures. This was my fifth visit to Summerland in the past few years, and it’s one of the few “touristy” destinations that I think really live up their billing. Unfortunately, this year we missed the wildflowers, but it’s always a breathtaking place. A little higher we began to encounter a bit of snow and a few late-blooming fields of purple daisies. As we ascended to Panhandle Gap (elevation 6,800), we ran into more snow than I’ve seen up there before, but there was nothing challenging. We quickly joined a group of five other scenery gawkers at the Gap. Mt. Adams took over the horizon and the expanse of Ohanepecosh Park spread out below us. We took a bunch of photos, and then started the glorious descent through down to Indian Bar. Here, there were fields of purple lupine and red and magenta paintbrush still coating the hillsides and big, fat, bumbly bumblebees were in their own kind of heaven. There were several snow crossings, but again nothing difficult. The final bit down to Indian Bar features about a million water bars, but that’s OK because I didn’t mind slowing down to look around. Within a mile or so of Indian Bar, the trail winds through fields of blueberries, which made me wonder about bears, but I didn’t see any. After Indian Bar the Wonderland Trail pushes up and out of the Ohanapecosh Park and then wanders up and down, and up and down, along a ridge. This was a busy section of the trail, with many backpackers looking pretty hot as they climbed up from Box Canyon on their way counterclockwise along the route. We leapfrogged two guys doing the full Wonderland Trail a couple of times, and passed few folks out for day hikes, but mostly just kept trucking along with the occasional stop to appreciate Rainier as well. Be sure to stop and look behind you between Indian Bar and Cowlitz River Trail … it’s well worth the “wasted” time! Just as you’re done with the ups and downs, you hit the intersection with the Cowlitz River Trail, where we started the 4-1/2 mile descent toward Eastside Trail and the Grove of the Patriarchs. Cowlitz is a nice change from the busy Wonderland Trail; we saw only two other people on this section of the route, and the trail was less worn and dusty. However, I love it when I can let loose on a descent, but Cowlitz is not one of those trails; it was more Parkour course with trees still blocking the way in places, and parts washed out with rocky drops and grooves. And while it was nice to be in the shade after the climb out of Indian Bar, it became stuffy and a bit oppressive. By the time we popped out on Stevens Canyon Road, we were both feeling a bit beat up. Eastside Trail takes you up about 1,000 feet along a little more than 6 miles of trail and is shaded the whole way—a gentle ascent reminiscent of the Siuattle River Trail we’d run earlier this summer. There are many pretty little creek crossings and waterfalls along here, but we saw only three people on this stretch of trail. In an odd juxtaposition to feeling like we were out in the wilderness with still a ways to go, because the trail runs parallel to Highway 123 we were serenaded by distant Harleys, the thumbing of bass speakers, and trucks most of the way. By the way, Eastside Trail is a bit overgrown in places and lots of spiders are building their webs here, so watch out! When we reached Deer Creek we refilled with water one last time and had a snack. We now had 2,000’ of climbing over 4.7 miles to get up to Owyhigh Lakes and the beginning of our final descent. Much of this climb is in the woods, so there were few views, and we focused on steady onward progress. As Ana reported in her blog, my stomach had begun rebelling against the journey and the day’s heat, and I don’t really remember much about the climb except that I was pretty happy when it was over. As we arrived at Owyhigh Lakes, we herd an elk bugle and I spied a small herd of elk wading in the larger, eastern lake. (Finally, points for wildlife sightings!) When I looked back a minute later, they were running south across the meadow and looked like a flickering film reel as they went in and out of the trees in the near-dusk light. We took a moment to find our headlamps, knowing dark would come before we got to our car. This final section is 4.6 miles down 1,600 feet, and we were thrilled to find smooth, buff trail the whole way. I was pleased to run most of this, despite my unhappy stomach, and it went by quickly. Once we reached the road, we had an easy mile on pavement to the car. As a post-note, everyone but the cat was sound asleep when I got home, and after a quick shower I slipped into bed with heart and soul full. The next day, my husband and I packed up the car and the kids for two days of car camping—and I have to say, that hammock was mighty comfortable!